* When the light is dim, please charge it immediately, otherwise it will affect the life of flashlight seriously. * Please do not use it when charging , otherwise it wood burn the electric stuff and elements. * The most charging time should be less thean 15 hours . USB TORCH: Built-in 1800mAh Battery. USB for Convenient Charging. No Longer Worrying about Changing Battery. Fits all Power Plugs. POCKET MINI SIZE: 3.6 X 1 X 0.9 Inch. Palm Size. Portable in Pockets. Attached Firm Wrist Strap. Can be Hang on Bag, Wrist, Belt, ect. 4X ZOOMABLE: 0.4 Inch stretching Length. Large Zoomable Range. Zoom Out for Narrow Spot Beam. Zoom In for Wide Flood Beam. 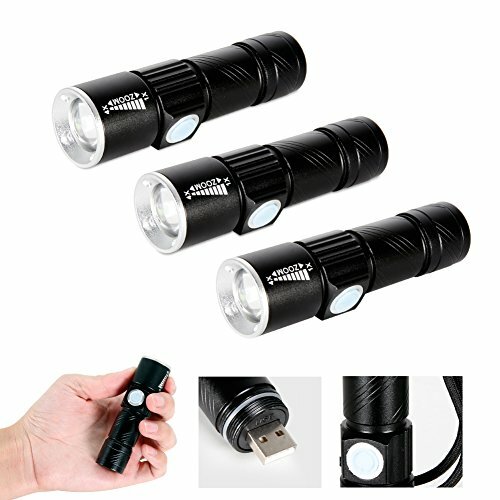 UNISEX MINI USB TORCH: Pocket Mini Size. Bright Zoomable Beam. For Women, Used as an Emergency Torch when Encounter Danger. For Men, Used for Illumination, Camping, Hiking, Traveling, Gardening ect. If you have any questions about this product by Maketheone, contact us by completing and submitting the form below. If you are looking for a specif part number, please include it with your message. Brady 43185 10" Width x 7" Height B-555 Aluminum, Black on Yellow Fall Protection Sign, Header "Caution", Legend "Use Hand Rail"